We love mashed potatoes. 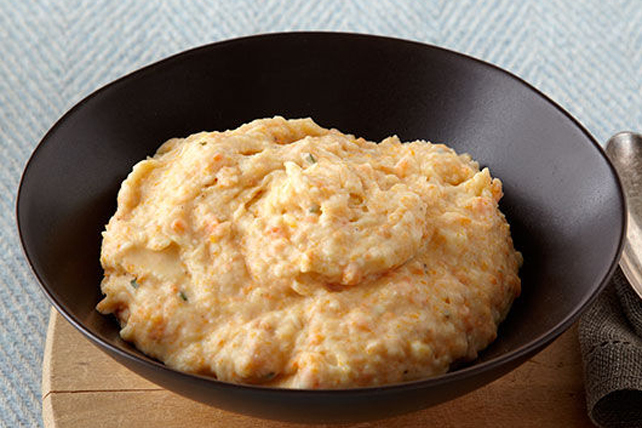 But potatoes mashed with sweet baby carrots and cauliflower? This side dish is delicious, and colourful, too! Bring vegetables and broth to boil in saucepan; simmer on medium-low heat 15 min., stirring occasionally. Drain vegetables, reserving 2 Tbsp. broth. Place vegetables in medium bowl. Add cream cheese, garlic, rosemary and pepper; beat with mixer until creamy, gradually adding reserved broth. Substitute 1/8 tsp. dried rosemary leaves for the chopped fresh rosemary. Serve this irresistible vegetable side dish along with your favourite grilled lean meat.